Work continues to progress on the innovative Sheffield-Rotherham tram-train project which has moved into the final stages of construction. New vehicles will eventually run between Sheffield city centre and Parkgate via Meadowhall South and Rotherham town centre. Following the collapse of the lead contractor, Carillion, Network Rail has confirmed that the "project remains on schedule to deliver the infrastructure to our partners in South Yorkshire Passenger Transport Executive and Supertram to allow driver training to begin while the final infrastructure work and testing is completed this Summer." 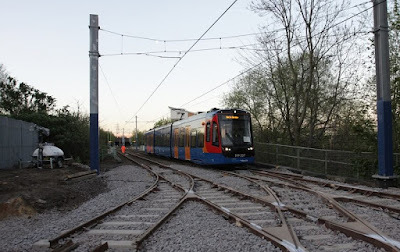 Network Rail has struggled to get to grips with the upgrades needed to the heavy rail sections of the route, and having originally being delayed, work was completed in April on overhead power lines in the Tinsley area to connect the Supertram and Network Rail routes. The new vehicles have been spotted on the heavy rail network at night. The Department for Transport (DfT) is the client in the project and South Yorkshire Passenger Transport Executive (SYPTE) is responsible for the delivery of all of the light rail modifications, rail replacement and procurement of the vehicles. Network Rail is separately responsible to DfT to deliver the heavy rail modifications required for the project. Following the liquidation of Carillion, New Civil Engineer reported that the Network Rail contract for the project was picked up by the Rail Electrification Alliance, a JV between Network Rail, VolkerRail, Siemens, J Murphy and Sons, Jacobs and TSP. Community safety manager at Network Rail, Vicki Beadle, has been visiting local schools to deliver the safety message. She said: "Many people – and not just children – think that the overhead line only carries electricity when trains, or Tram Trains, are coming through. That's simply not true. The wires are electrified all the time and these ones carry 750 volts. We don't want anyone's life to be irreversibly changed by coming into contact with that so we are making our message clear – the electricity is always on, so stay off the tracks." Testing of the vehicles, which have been in use on the existing network in Sheffield since September, is taking place and further work includes the construction of low level platforms at Rotherham Central and a new stop at Parkgate. Beadle added: "Regular tram users will be used to crossing directly between platforms, across the tramlines. We need to remind people that this simply isn't safe on the rail network as a train could be coming through on the other lines and the driver can’t swerve and won't be able to brake in time. Please remember to use the footbridge if you need to change platforms." A report from the National Audit Office (NAO) criticised the management of the trial when it revealed that by December 2016, the cost of the works, which had been given an initial estimate of £15m, had quadrupled to £75.1m, pushing the overall cost of the scheme over £100m. The Government's Public Accounts Committee looked at the issues of cost increases and delays, the under-estimation of the scale and complexity of the works, and the risks involved in delivering new technology. It said that the project, first mentioned in 2009, had all the makings of a "how not to" seminar for future projects.